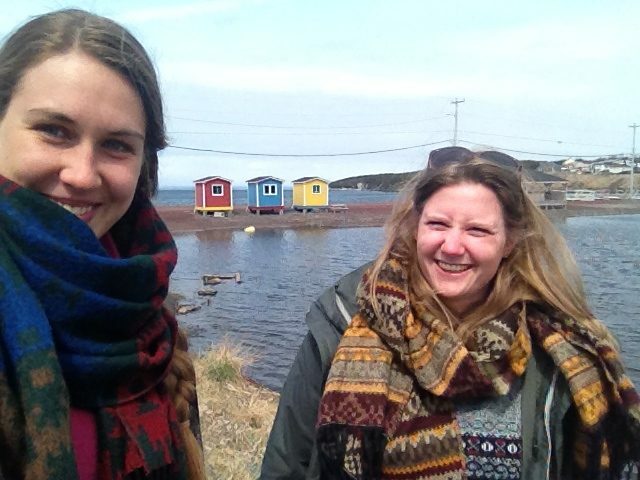 We, Meike and Sarah, are two German girls who came to Newfoundland, Canada to do research. We spent three months in Newfoundland studying the opportunities and challenges of the FAO Voluntary Guidelines on Small-Scale Fisheries for the province of Newfoundland and Labrador. We conducted this research project together with Memorial University, TBTI, and our home university, Van Hall Larenstein University of Applied Sciences in the Netherlands. We spent part of this time in the TBTI lab in St. John’s where space and help was always kindly provided. We heard a lot about Newfoundland and Labrador before we left, especially regarding the disappearance of the codfish from the province. During our research, we learned more about how it influenced the province, its people, decision-making processes, and the management of the remaining fish resources. Since we conducted interviews as part of our research, we experienced the importance of small-scale fisheries sector for Newfoundland and Labrador; it is the backbone for rural coastal communities. The people we interviewed were proud to be small-scale fish harvesters and told us their stories; they shared their lives, their wishes, their worries, and their hopes with us. We saw how much inshore fisheries mean to those people and grasped the importance of the sector. However, we did not understand one thing: when we did our grocery shopping, we were most surprised at how hard it was to get good, fresh caught fish in the supermarket, even though we checked several stores to get fresh caught fish. We thought that people in the province would eat much more fish – at least fresh fish and not the fried version of it. It was quite a shock to see the minimal offer of fish. We thought that it would be so much nicer to see more fresh fish in the supermarkets because, when compared to the meat section in every supermarket, the offer of fresh fish was a bit disappointing. But we hope that, since 2015, fish harvesters are allowed to sell their fish not only to restaurants, but also to the general public, fish will get back on the plates in most of the homes. During our limited amount of time in the country we traveled to several parts of the province, met wonderful people who were extremely friendly, and showed us their hospitality. At one point, we were overwhelmed how welcoming people were to us. During our time in Newfoundland, we learned a lot about the small-scale fisheries sector and its importance. We had great experiences that we will never forget. We are thankful to all people welcoming us with open arms and we are thankful that we got the chance to work together with TBTI and its members. It was a great and illuminating time for us, and our journey to Newfoundland was definitely not the last one since we need to come again in the summer time to eat fresh lobster and experience a real Newfoundland summer – if there is one.